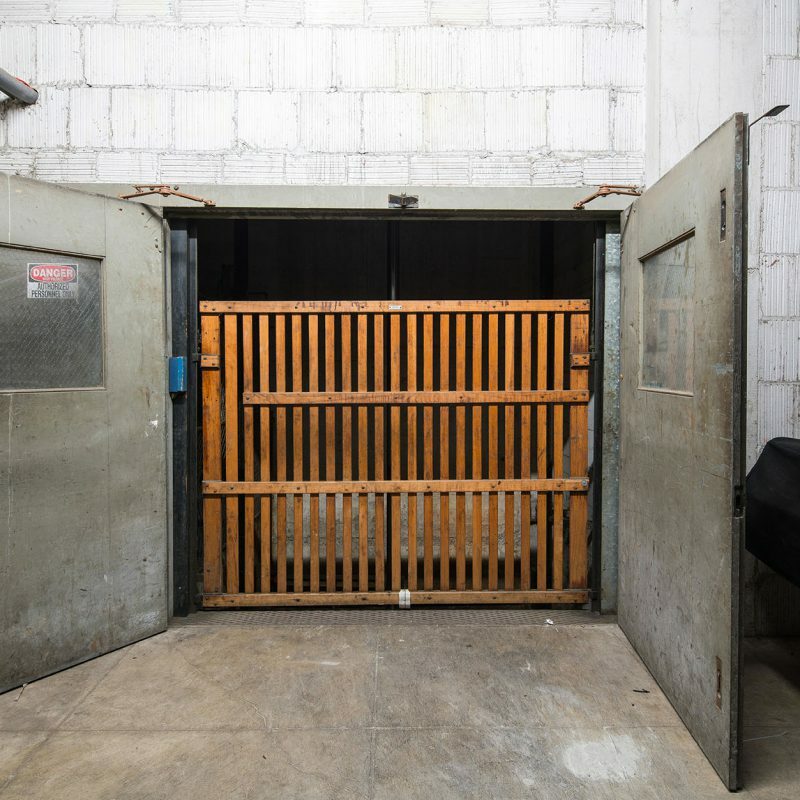 Entrance to the stage for scenery and performers is through the 8’0” x 8’0” double stage door located on the western side of the building (up stage right). A 4’6” wide ramp leads from the door down to the stage level. Normal configuration for the Theatre is with the orchestra pit covered. There is a fee of $600 for use of the orchestra pit to cover the cost of removal and replacement of the pit cover. Dressing Room “A”: located off-stage right and accommodates 4 to 6 persons. It includes a private toilet and sink. Room size is approximately 10’ x 12. Dressing Room “B”: located off stage left and down a few stairs. It accommodates 8 to 10 people, has one private toilet, two sinks, and a small air conditioner. Room size is approximately 12’6” x 17’ 0”. Dressing Room “C1” through “C8”: located on the second and third floors off stage right. 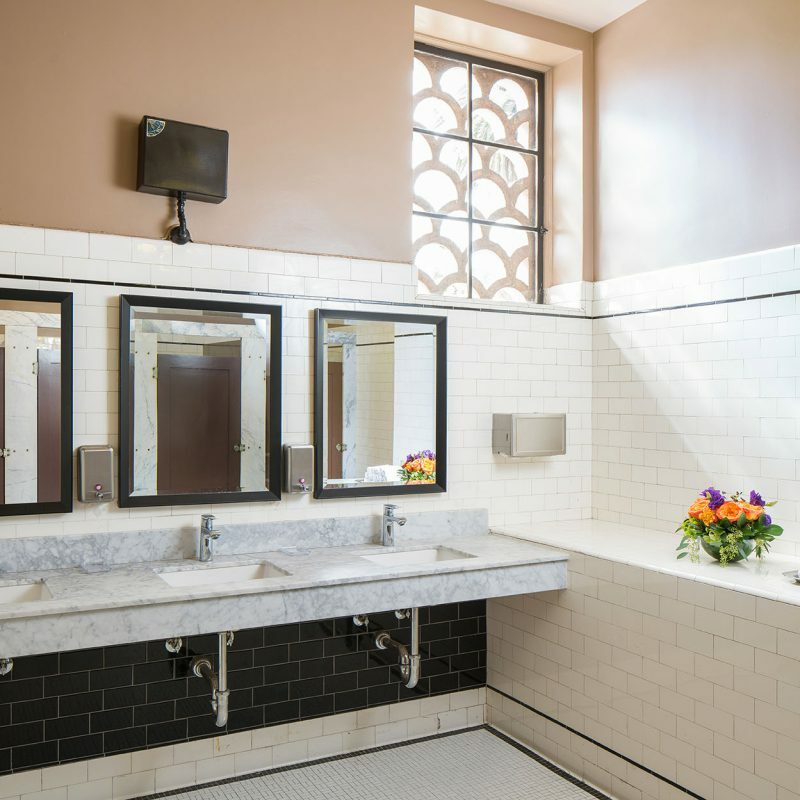 Each dressing room is 5’ x 8’ includes a sink and accommodates 2 to 3 persons. Two toilets are located at the front of each hallway. The Ebell does not provide phone service. For further information regarding DSL or other high tech phone lines contact the production stage manager or the theatre manager. Wireless connection to the internet is available. Our wireless connection is DSL (Not sdsl or adsl) with a download speed of 50 Mbs and an upload speed of 50 Mbs. WiFi Password provided on request. Hearing assistance devices for audience members are available on request.Please see the Theatre Manager. NOTE: When Producers supply their own sound system, a line level house mix must be provided to the Ebell ADA system. No exceptions! 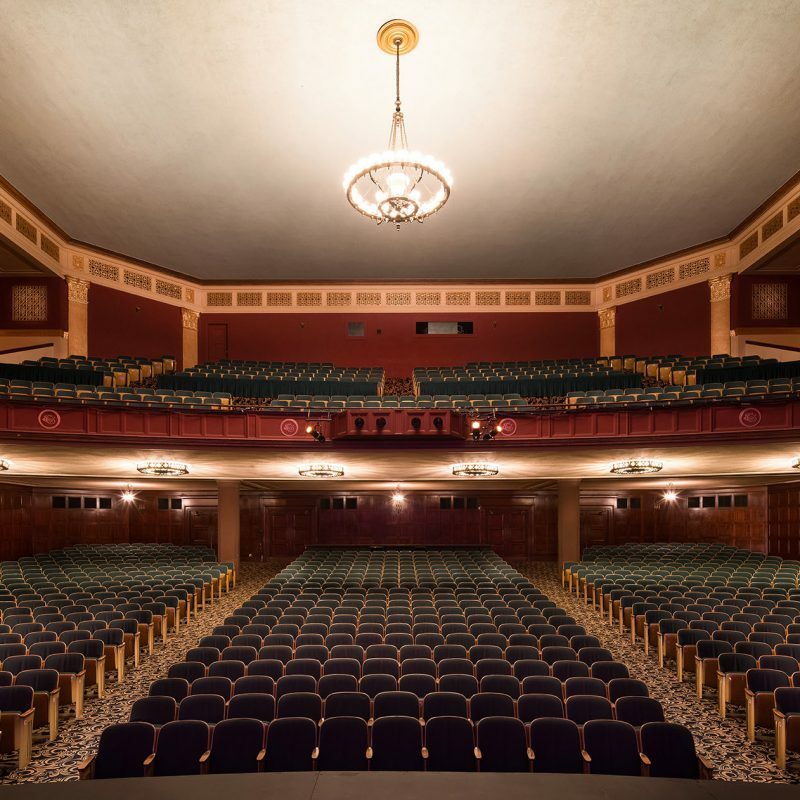 The Wilshire Ebell Theatre provides a state-of-the-art Line Array style Public Address system as part of your basic rental package. The specifics of this house PA system are listed below. At additional cost, also available upon request are upgraded sound packages, to include Monitor rig packages, additional PA boxes, microphones, playback devices and further rider fulfillment. Thank you for your understanding in advance that the Ebell house PA system is a permanent install and does not come out of its house hang position. 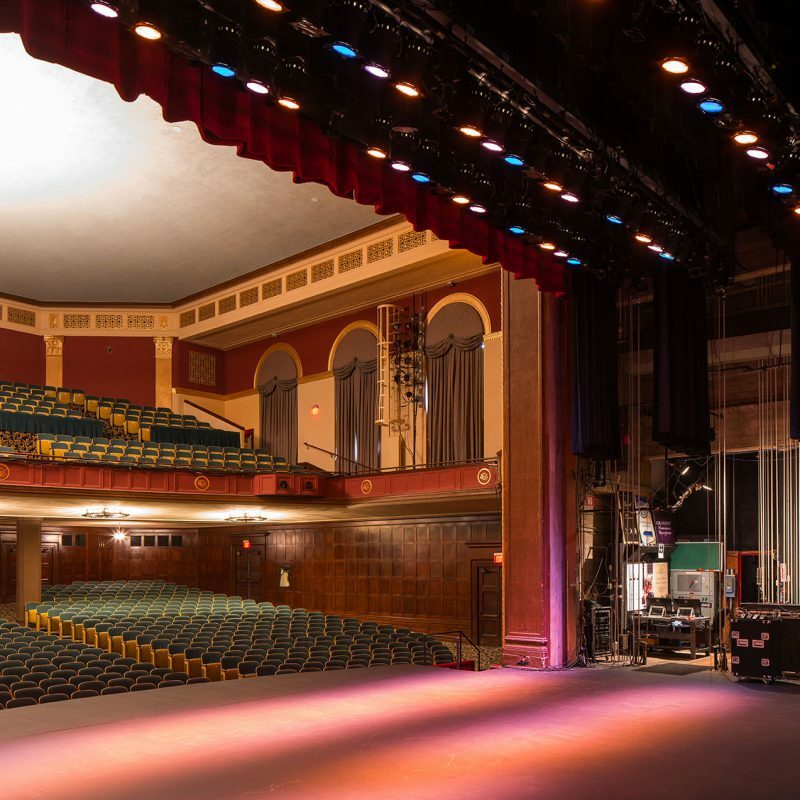 Ebell Sound or Producers sound may be mixed from either back stage or from a FOH position. Mixing from the FOH involves the killing of at least 14 seats up to 28 seats in Rows X &Y in the center section of the orchestra. No other positions are available. The Ebell Theatre uses “Technical Projects” brand headsets. A total of six (6) are available for use. The producer may supply additional headsets to add to our system only if they are either Tech Projects brand or Clear-Com brand. NO EXCEPTIONS! The Wilshire Ebell Theatre does not have an inventory of scenic materials, props, flats, or drops except as listed below. The use of any “HOUSE” furnishings (i.e. lobby tables, chairs, or benches) is prohibited! A basic lighting system is provided as part of your rental package. All equipment is hung, circuited, and colored according to our house plot. 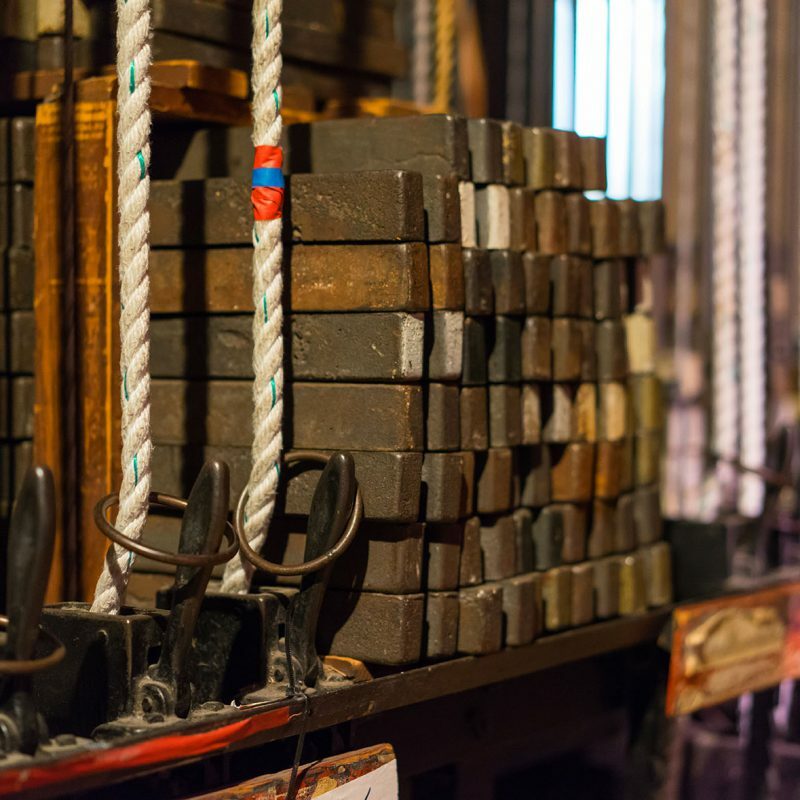 Any changes to the house plot, including the re-hanging, re-focusing, or changing of colors of house lighting equipment is only with the permission of the Production Stage Manager. All changes must be restored immediately after the final contracted performance according to the original house plot as part of your load-out. Additional charges may be applied for failure to restore the house plot. 1 – ETC Element control console with monitors. The board can be operated from the Frontof house or from backstage. 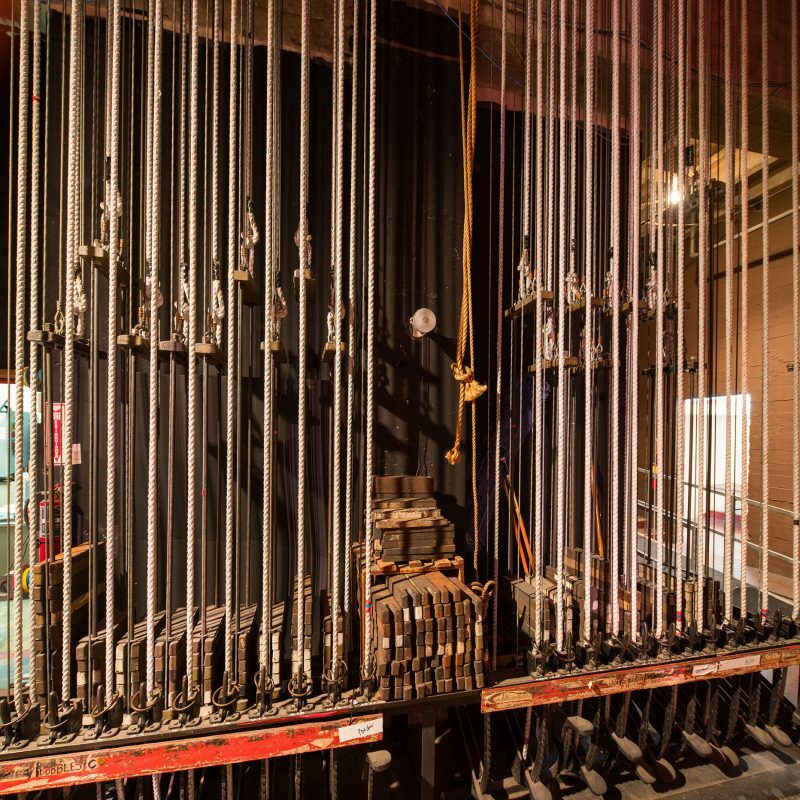 Operating lights from the FOH involves the killing of at least 14 seats up to 28 seats in Rows X & Y in the center section of the orchestra. No other positions are available. 167 – Digital ETC dimmers (dimmer per circuit) at 2.4K each. Circuits are permanently located in floor pockets located around the stage and overhead on one of four electrics. 2 – 1200 watt Lycian follow spots are available upon payment of a rental fee ($200 for a 4 hour show call) which includes an Ebell operator. Color temp is 6 K.
Instrument inventory is limited to those shown on the house light plot and plugging chart. Color is as indicated. Any additional instruments or color is the responsibility of the producer. Two road boxes are located Stage Right. All stage battens are 1 ½” schedule 40 pipe and are all 50’ long. Batten cabling is all ¼” fully rated aircraft cable. Batten weight capacity is determined by arbor size (350 or 300 lbs). Rigging of all scenic materials (e.g. drops, banners, flats, etc. ), lighting or audio equipment will be allowed provided all safety precautions are met. The Ebell reserves the right to require the producer to hire a certified rigger to supervise or perform all rigging installations (e.g. chain motors etc). Points are available for front of house lighting truss. Points are 33’ from the fire curtain and centered 36’ apart. Height to ceiling is 50’. Audio points are 8’ from the fire curtain and Centered 46’ apart. All measurements are approximate and for reference only. As noted above a certified rigger is required. Referrals on request.